NY Times Best Selling Author, Matt Kepnes, known to you as Nomadic Matt wasn't always a intrepid globetrotter. In fact, as a child Matt wasn't afforded the opportunity to travel. It actually was not until he was into his adult years did he have the chance to explore outside his home town of Boston. It was his first trip to Costa Rica in 2003 that opened his eyes to all the world had to offer. Matt immediately fell in love with travel and the freedom it granted him. In a drastic change of events following this trip, he came home, quit his job and began a year long adventure around the world that eventually changed into a seven year adventure exploring destinations all over the globe. At this point in his life, Matt never looked back. "Travel has shaped my life and given me purpose. Opening yourself up to new experiences can have a powerful impact on you, and help you figure out who you are and what you want to be." Now 13 years later Matt has become an icon in the travel industry. Starting with his award winning travel blog: Nomadic Matt, his NY Times Best Selling book: How to Travel the World on $50 a Day, the creator behind an online media school for aspiring bloggers and even the owner of a hostel in Texas. Now Matt's newest venture is the one that will inspire and impact the lives of so many others. This is the mission of FLYTE. FLYTE, the Foundation for Learning and Youth Travel Education, is a non-profit that helps with the logistical support and funding for teachers looking to provide cultural context for what they teach. It was created to assist students from underprivileged areas on dream trips to explore the world. 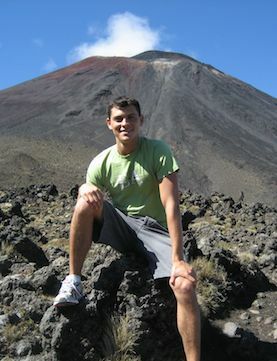 In 2015 Matt co-founded the organization with Courtney Dalton, also a traveler and a former financial and budgetary manager for study abroad programs. Being in this business, Courtney understood the struggle and costs involved with international education. She believed in the purpose of studying abroad but also knew it was not financially possible for all. Together they knew they could make a difference. "Travel changes people’s lives. This is especially true for young people who are at a time in their life where they are still figuring out who they are and where they fit into the world. It is an age where exposure to a variety of ideas and cultures can create a huge impact, and can inspire them to do something or be someone they never would have considered before." When starting this venture Courtney & Matt quickly learned many of the students that they met with this program had never even left their local community in which they live, much less the state and the country. They wanted to inspire them to venture outside of the familiar environments and comfort zones and view the world from a different perspective allowing them to see that the world is so much bigger and expanding upon their own experience. "We want to bring the power of travel to kids who might not otherwise get the chance to see the world. We want to see our students follow aspirations to continue with their education beyond high school, and to become active and engaged citizens in the world." In just under a year, FLYTE raised $20,000 to send their first group of students to Mexico! Matt's future of FLYTE is to reach into more geographical areas around the world and provide students with even more destinations to explore. While spreading the word of this organization, Matt will continue to travel the world and inspire other's with his writings. Follow along on the FLYTE Facebook page or on the TIS donor page to see updates, future trips and upcoming missions for the organization. Travel Italian Style Partners with FLYTE! Here at Travel Italian Style, we truly believe in Nomadic Matt's mission. We support the notion that travel changes lives. It promotes new outlooks, helps you build character and gives you incredible experiences that will remain with you forever. In fact, Travel Italian Style was created because our founder had the wonderful opportunity and the means to step on a plane to Italy for the very first time in 2006. It was an amazing experience that changed her life but she knows it was a privilege to have this adventure. Therefore, Travel Italian Style has become a proud partner of FLYTE. For every tour we sell 2% of the profits will go directly to the organization. The money donated will go directly towards paying for a students’ airfare, meals, school books, ground transportation, and accommodations when they abroad. "This partnership not only offers the monetary support to pay for our programs. It is an example of the travel industry giving back, making travel a catalyst for social good." Remember: "Giving is not about a donation, it's about making a difference." To see more on FLYTE or to donate today visit their website at http://www.takeflyte.org/. Giorgio Velardita Nardini was born and raised outside of Rome. He is joining the TIS team as International Public Relations and Branding Advisor. As a passionate amateur photographer, traveling is the thing he loves the most and can’t live a day without thinking about his next destination. Giorgio shares his photos and advice on his very own blog wanderlustdaily.com/en which is written in both in Italian and in English. Halie Taylor is the Travel Marketing Trends Coordinator for Travel Italian Style and is currently a senior at College of Charleston in Charleston, SC where she is majoring in English with a concentration in Creative Writing. Living in Charleston, Halie developed a love for beautiful scenery and unique culture.